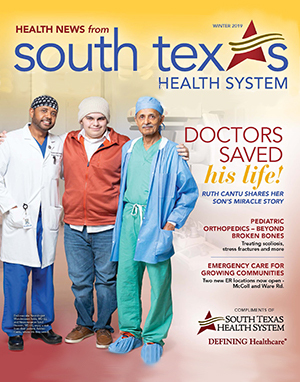 Health News from South Texas Health System is a publication designed to bring you the latest news as well as health and wellness information you can use throughout the year. You can read the latest issue here, or sign up to have Health News mailed directly to your home. Helping to mend broken bones is all in a day’s work for Pediatric Orthopedic Surgeon and Scoliosis Specialist Michael T. Lago, MD. He shares insights on the unique challenges of childhood fractures, breaks and a whole lot more. Complex neurological challenges require sophisticated responses. See how the neurointerventional suite at South Texas Health System McAllen is making a critical difference – 24 hours a day, seven days a week. Ruth Cantu’s 14-year-old son, Aristeo, collapsed in her arms one day. His road to recovery was a testament to teamwork, technology and ready access to essential treatments. 40-year-old Agustin Acosta didn’t think a heart attack would ever happen to him. The day that it did, he needed help – fast. Read about his treatment team’s record-breaking response.